First we clip your pet's nails and then we rotary file each nail to smooth it. This helps keep your pet from unintentionally scratching us humans, or snagging our furniture or carpeting. Then we use an enzymatic toothpaste and specially designed toothbrush to help keep plaque and tartar to a minimum and keep your pet's breath smelling fresh. Finally, we gently clean your pet's ears to remove excessive wax build-up reducing the risk of harmful parasites. * Please note that, for the safety of our staff: a) We do not trim nails on our feline clients. b) We can only groom kittens and cats that have had at least their front paws de-clawed. In addition, we do not offer our teeth brushing or our Blueberry Facial Massage for kittens or cats. Brushing your pet reduces shedding, aids in circulation and helps in the prevention of fleas and ticks. Frequent brushing can prevent painful matting of the undercoat and top coat. Daily brushing at home and professional brushing every two weeks is recommended. Regular bathing is a cornerstone to your pet's clean, shiny and healthy coat. Bathing will help to loosen and remove, which keeps your pet, and your home, smelling fresh. Before bathing your pet, it should first be brushed thoroughly. Shampoos that are specially designed for dogs and cats should be used because the human shampoos we use have a pH level that can be harmful to your pet's coat. We recommend professionally bathing once every four to six weeks and at least once at home in between visits to The Pet Pamperer Dog Grooming Salon & Studio - depending on your pet's lifestyle. This package includes: hand brushing to remove loose hair and smooth coat, mild shampoo (specific to your pet's coat type), massage and cool air blow dry, nail trimming, ear cleaning, and your choice of a bow or bandanna (teeth brushing extra). Cost varies by size, breed, coat condition, temperament, special bath needs (ie. hypo-allergenic, medicated, oatmeal or skunk bath), and frequency of grooming. A dog requires a haircut even more so than people. Depending on the breed, your pet may require very little trimming or hair clipping, while other breeds will need it every four to six weeks. Your Petpamperer Pawfectionist will help you understand the frequency that is best for your pet. This package includes: a haircut and all services from the Brush, Bath & Cool Air Blow Dry Package - plus choice of cologne (teeth brushing extra). Cost varies by size, breed, coat condition, temperament, special bath needs (ie. hypo-allergenic, medicated, oatmeal or skunk bath), and frequency of grooming. A dog requires a haircut even more so than people. Depending on the breed, your pet may require very little trimming, hair clipping, or hand stripping, while other breeds will need it every four to six weeks. Your Petpamperer Pawfectionist will help you understand the frequency that is best for your pet. This package includes: detail hand stripping and all services from the Full Service Pet Groom Package - plus choice of cologne (teeth brushing extra). Cost varies by size, breed, coat condition, temperament, special bath needs (ie. hypo-allergenic, medicated, oatmeal or skunk bath), and frequency of grooming. After your puppy reaches at least 3 months of age and up to 5 months of age, The Pet Pamperer Dog Grooming Salon & Studio offers a 'First Groom Package'. The 'First Groom Package' includes: a light brushing, a very gentle bathing, and then towel and cool air blow drying. If needed, we then do a light trimming of the furnishings and paws, being careful to leave enough protection around the pads, so that they can safely go on those precious walks with you. We will also do a gentle ear cleaning and nail smoothing. This service is then topped with a bow or bandana. Or, for first time canines between the ages of 5 months and 7 months, we'll start you out at 10% OFF our normal grooming charge of the Full Service Pet Groom Package (full details listed below). * If you would like, we can also get your pet used to our teeth brushing service at 10% OFF our normal charge. * Also available is our Blueberry Facial Massage at 10% OFF our normal charge. The Blueberry Facial is a mild, soothing facial and brightener. We love our feline friends too, and offer the same holistic approach to grooming for these friends. Patience with a feline is very important. It takes a feline longer to get used to the bathing and grooming routine than their canine counterpart. After your kitten reaches at least 3 months of age and up to 6 months of age, The Pet Pamperer will do its first groom at 10% OFF our normal grooming charge. The 'first' groom includes: a very gentle bath and a light brushing. Nail trimming is an important part to the overall well being of both cats and dogs. Your pet's nails should be professionally done every four to six weeks. A pet owner should consider doing an interim nail trimming every week or two (we can help show our canine customers the trick). Without regular attention, unmaintained nails may cause a pet's paw to turn inward or outward, which can lead to problems with their ability to walk, run and stand, as well as, their posture in general. If the problem is left unattended it can lead to lameness with the nail growing into the pet's pad, thereby becoming infected. Eventually it will split, break or be torn away completely, which will then require veterinary attention. Unmaintained nails at the very least, can badly scratch a child's or adult's skin, as well as, cause damage to clothing, furniture, carpeting, wood flooring etc. 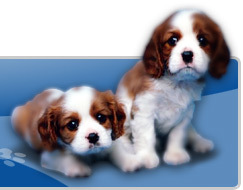 Our Canine Nail Trimming service is offered by itself or in many of our packages. Our Canine Nail Trimming service is a relatively quick turn around time and can be done while you wait or as a drop-off. First we clip your pet's nails and then we rotary file each nail to smooth it. This helps keep your pet from unintentionally scratching us humans, or snagging our furniture or carpeting. * Please note that, for the safety of our staff: a) We do not trim nails on our feline clients. b) We can only groom kittens and cats that have had all four paws de-clawed. In addition, we do not offer our teeth brushing or our Blueberry Facial Massage for kittens or cats. * Difficult pet's may have up to a double sur-charge. Your pet's ears should be professionally cleaned by The Pet Pamperer Dog Grooming Salon & Studio every four to six weeks (we do not recommend the pet owner to do this at home). The ears are very sensitive and susceptible to infection, excessive wax buildup and parasite infestation. Our gentle approach and our gentle cleaning products will prevent most problems. However, if your pet has constant itching, scratching or if ear odor persists, a veterinarian should be consulted. Our Ear Cleaning service is available by itself or in many of our packages. Our Ear Cleaning service takes very little time and can be done while you wait or as a drop-off. We gently clean your pet's ears to remove excessive wax build-up reducing the risk of harmful parasites. Like us, dogs should have their teeth brushed daily to reduce tartar and plaque, which will help in keeping their breath smelling fresh. Frequent teeth brushing also helps in reducing the risk of periodontal disease. More than 85% of dogs and cats older than four years have periodontal pathology. Periodontal disease starts with the formation of plaque, a transparent adhesive fluid composed of mucin, sloughed epithelial cells, and aerobic, gram positive cocci. Plaque starts forming twelve hours after dental cleaning. If the plaque is not removed, mineral salts in the food will precipitate to form hard dental calculus. The calculus is irritating to the gingival tissue, changing the ph of the mouth allowing pathogenic aerobic gram negative bacteria to survive subgingivally. By-products of these bacteria "eat away" at the tooth's support structures eventually causing the tooth to be lost and eventually jaw bone destruction. A special canine toothbrush and toothpaste is available. People typically visit a dentist once a year to have their teeth professionally cleaned, but a dog needs much more frequent professional teethbrushing. We recommend that your Pet Pamperer Pawfectionist brush your dog's teeth once per month, but at a minimum, every other month, to help prevent periodontal disease. A veterinarian should be consulted if dental problems persist. Our Teeth Brushing service is available as a stand alone service or in the Pawdicure, Teeth and Ear Care Package. The stand alone service takes very little time and can be done while you wait or as a drop-off. We use an enzymatic toothpaste and specially designed toothbrush to help keep plaque and tartar to a minimum and keep your pet's breath smelling fresh. All-natural Flea & Tick Bath Treatment - Warmer weather promotes flea and tick activity. If your pet is scratching more than usual, it could be the tell tale signs of these parasites. If something around the base of the dog's tail looks like pepper, your pet has fleas. Experts estimate that for every flea on your pet, there are about 100 in your home. Our Flea & Tick Bath should be supplemented with other home treatments for your furniture, bedding and other areas your dog has access to. Consult your Pawfectionist for comprehensive information on eliminating these pests from your home. All-natural Blueberry Facial (an all natural, tearless, calming, cleansing, color brightening product with a delicious scent - it is a gentle, relaxing, 4 - 5 minute massage over the snout, jaw, jowels, temples and neck area behind the ears. We then top the treatment off with a nice, warm towel applied to the face for approximately one minute. Offered only with one of our packages that includes bathing.